If you homeschool your child, we’re sure you know how tough it can be to keep their interest in learning something new. One of the best reasons you chose to homeschool your child is the flexibility you’re allowed. This means flexibility in time as well as content and curriculum. Finding new and creative ways to keep your child constantly interested in learning something new is tough. Luckily, living in Orange County, there are so many parks to visit to learn about everything from history to science and nature. If you are looking for a hands-on experience in your next science lesson, consider visiting Corona del Mar’s tide pools, right in Orange County’s backyard. Corona del Mar State Beach is a protected area. This means all plants, animals and their habitats are protected by law from arsonists, fish collectors and nature thieves. Many travel here from all around the world, but it is against the law to take a single thing from this beach. Lucky for you, living here, you can easily come back again and again for new and exciting science lessons each time. I know flexibility is one of the reasons you opt for homeschooling, but if you really want to meet all the animals that live in the tide pools, you need to get there early. The tide schedule varies from time to time, but low tide is usually around 6AM, and high tide hits at 11AM. Make sure you wake up bright and early for this field trip. Corona del Mar State Beach is a little strip of beach between Newport Beach and Laguna Beach. Take PCH and just follow the signs. To get to the tide pools, you’ll have to be ready to get active and climb over some rocks to get to Little Corona del Mar… but the effort will be worth it. Wear water shoes with treads. 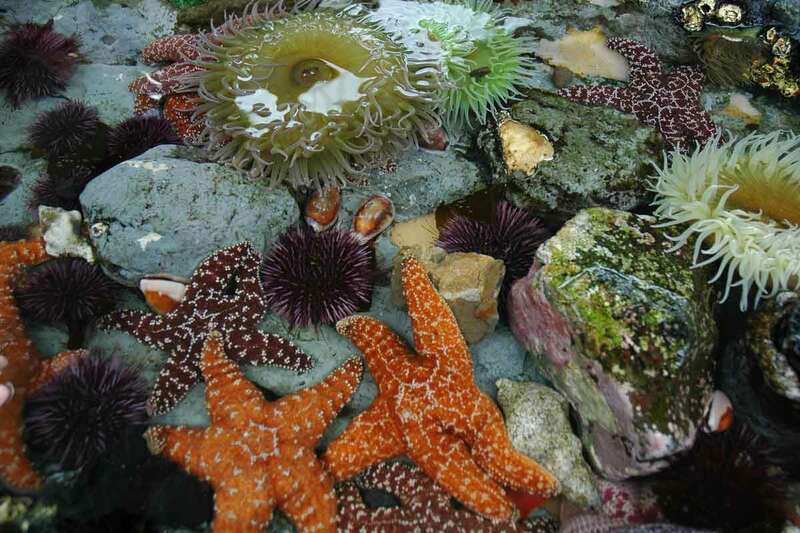 You’ll find many different types of plants, animals and all the organisms in between, such as sea urchins, sea anemones, crabs and even octopus! You’ll have to look closely deep in the little pools and crevices, but it’s worth it. Please be careful not to step on any animals or their homes, after they’ve so so kindly invited you to visit. Your child will learn about the natural habitats of animals and can experience live, how the plants and animals of one area live and help one another survive. They can learn about different types of relationships found in nature between plants and animals, animals and other animals, and even between people and the habitat as a whole.